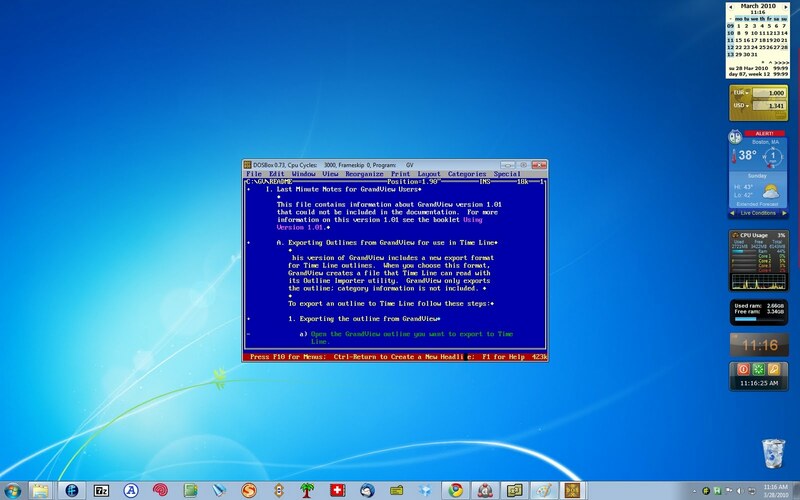 As you know, DOS applications do not work in Windows 7, and Windows 7 (64 bit) has even more problems with them. 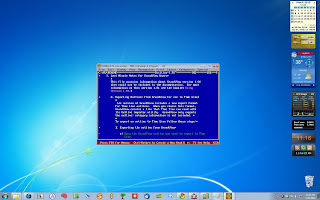 You could install a Virtual Machine that emulates XP, but I find it is not worth the trouble for occasionally playing with such applications. For some reason, capturing the full-screen application does not return the proper colors, but this is what it looks like (except with the blue color scheme). A wasted Sunday morning? Perhaps ... but perhaps it could also serve as a new version of minimalist computing? 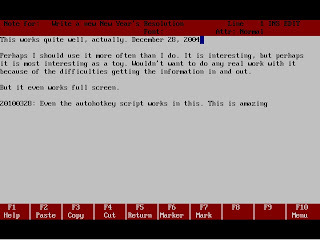 Wordperfect MS-Windows for DOS, Grandview, they all run in DosBox. 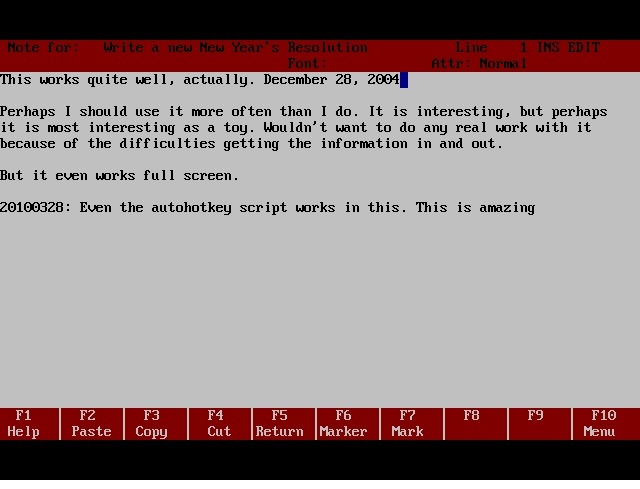 You could even install Windows 3.1 ... to run the first version of InfoSelect ... But I won't. I just wish that the unparalleled text matching of Agenda was realized in my favorite application. By the way, there is DosBox for the Mac as well. 1. Actually, the color scheme changes only if you capture the screen of the full-screen application. If you just use it, it remains as expected. 3. See also Agenda. If you want to install DosBox, these instructions help. Treesheets is billed as the "ultimate replacement for spreadsheets, mind mappers, outliners, PIMs, text editors and small databases." It is freeware and works on Windows, Unix, and the Mac. "It's like a spreadsheet, immediately familiar, but much more suitable for complex data because it's hierarchical. It's like a mind mapper, but more organized and compact. It's like an outliner, but in more than one dimension. It's like a text editor, but with structure." It has a certain "geek-value," but I must say that the very unusual "box-within a box" metaphor does not click with me. It most like a spreadsheet, since it uses a cell-based structure. But each cell can contain large amounts of data. And you can zoom into these cells to reveal still other cells with more rows of information. It's like a babuschka doll, except the dolls contained within the dolls can be vastly different from each other. This may be said to violate what some have called the "nested doll principle" or the structure of "similar objects-within-similar objects" found in some interesting natural and man-made phenomena. I, for one, find it hard to remember what complex data may be hidden deeper in the hierarchy. Treesheet's structure seems to be hiding deeper levels rather than revealing them. It is accordingly not suitable for long-term dat-storage. But these reservations are probably just due to my shortcomings. I like my hierarchies relatively flat—at least during the discovery phase. Some time ago, shortly after its publication, I bought Richard Sennett, The Craftsman (Yale University Press, 2007). It was a great disappointment. I expected a careful sociological and philosophical analysis of the history and social role of craftsmanship. The jacket text promises that "the book names a basic impulse: the desire to do a job well for its own sake" and that Sennett shows how this impulse can survive even in the industrial age. Yet, all Sennett does is "name" the "basic impulse" and make some claims about it. The book is, in fact, not very craftsman-like. It is a "performative contradiction," one might say. From the Prologue: "I might have conducted this investigation by writing a strict linear narrative, beginning with the Greeks, ending where we are now. Instead, I have preferred to write thematically, going between past and present, to assemble the experimental record. When I've argued that the reader needs detailed context, I have provided it; when not, not" (15). We all know about the supposed evils of linearity ... and "experimental record" sounds good. But jumping from Aristotle's discussion of the demiurgos to the the medieval goldsmith to the "enlightened craftsman" and brickmakers appears to me too quick to provide any insight. Falsehoods along the way don't help: "The master's verdict were final, without appeal" (58). The guild was the locus of final appeal. And the guild actually forbade "experimentation." Tradition was almost everything. In fact, in some guilds masters were forbidden from inventing anything new. The conclusion is equally misleading: "Pride in one's work lies at the heart of craftsmanship as the reward for skill and commitment" (294). Apart from the Romantic mis-characterization of the reward as something completely divorced from the necessity of earning a living, this claim also underestimates the importance of the product. Pride, if it came into play, was primarily based on the quality of what was produced, secondarily on the social status that the profession brought, and it had little to do with "reflection and imagination"—something that is true even today. Perhaps it is true that "understanding the inner sequence of development in practicing a craft, the phases of becoming a better craftsman, can counter Hannah Arendt's conviction that Animal laborens is blind" (296), but I doubt it. The traditional craftsman started out as an indentured learner, could look forward to become a journeyman dependent on different Masters and the rules of guilds for the rest of his life, and even the Master was caught up in the economic necessity of the trade. A careful look at the developments having to do with the abolishment of the guilds during the eighteenth century would show how blind craftsman were, and how hard it was to become enlightened. None of this means that craftsmanship as the impulse to create the best product possible is not desirable. 1. The sentence about Hannah Arendt is followed by the claim that "ours would remain an innocent philosophical school, however, if pragmatism did not recognize that the denouement of this narrative is often marked by bitterness and regret" (296). My bitterness and regret is more limited: I wish I had not spent $27.50 plus tax on this book. This is an interesting post on why perfectionism is usually counter-productive (though it is not put in these terms). A quote of a quote from the website: "... simplicity ... is best described as the state of grace arrived at by a sober, modest, heartfelt intelligence. The main strategy of this intelligence is economy of means. Pare down to the essence, but don’t remove the poetry. Keep things clean and unencumbered, but don’t sterilize. .... Usually this implies a limited palette of materials. It also means keeping conspicuous features to a minimum. But it doesn’t mean removing the invisible connective tissue that somehow binds the elements into a meaningful whole." I took out the "wabi-sabi" stuff ... for the passages expresses the spirit of craftsmanship present in all cultures. This approach obviously has some relation to minimalism in computing and note-taking. 1. See also this and this, and that, and that. It also seems to me directly opposed to multi-tasking. Media multitaskers pay mental price—from August 24, 2009 ... but still relevant. Windows Live sync used to be called Windows Live FolderShare. I have now been using this free service for a few weeks, and I must say that I am impressed. 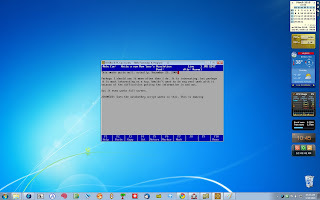 It synchronizes central folders (mainly ConnectedText Projects) on my Home, Office, and Netbook computer without the slightest problem. I never have to worry about whether my files on any computer are up to date. It does not store any files on the net. You have to sign up for Live sync. It's part of the Windows Live suite. I have also used Sugarsync and Dropbox . Live sync is more intuitive and faster (or so it seems to me). Dropbox is not really an alternative as it forces you to put the files or folders to be synchronized into the special Dropbox folder. But I do believe the two are complementary. So I use both: Dropbox for text and doc files I am currently working on, and Live sync for ConnectedText's Project folders. As I said, this system works like a charm. Apparently, there is an application in the Powertoy suite called Synctoy that offers a GUI for this. But I have not used it. Live Sync is supposed to work with Macs as well as PCs, though there seem to be problems with Snow Leopard. 1. See Windows Live Sync vs. Live Mesh vs. SkyDrive: Which is Right for You? for a discussion of the relative merits of each. I myself don't need (or perhaps better: want) storage "in the cloud." 1. See also the following stuff. Having spent some time last week looking at Simplenote, Notational Velocity, and some of the other minimalist alternatives, I noticed that many "Mac-centric" people claim they are most productive using a text editor of some sort, plus a lightweight markup language like Markdown or MultiMarkdown, also used by Scrivener. As John Gruber says, "Markdown is a text-to-HTML conversion tool for web writers. Markdown allows you to write using an easy-to-read, easy-to-write plain text format, then convert it to structurally valid XHTML (or HTML). - Thus, “Markdown” is two things: (1) a plain text formatting syntax; and (2) a software tool, written in Perl, that converts the plain text formatting to HTML." It occurred to me that Wiki Markup and lightweight markup languages have a great deal in common and that I have essentially been following the same approach for years: I write most everything first in ConnectedText, and then convert it to RTF, in order to finish it up in a word processor (which has been Atlantis for some time now). There is no reason why I cannot convert ConnectedText's markup into HTML. In fact, it's easier than RTF. ConnectedText supports exporting to HTML and XML for some time now. I just have to choose Topic|Export and choose the format. It would also be easy to export fragments of text by adapting the RTF script I talked about in Wiki Markup to RTL. Friedrich Schiller wrote to Christian Gottfried Körner on December 1, 1788: "The reason for your complaints consists, it seems to me, in the forcible control your understanding imposes on the imagination ... it is not good and disadvantageous to the creative processes of the mind when the understanding examines the incoming ideas before they have, as it were, entered the gates [of the mind]. One idea in isolation may be very negligible and very strange, but perhaps it will become important through another one which follows; it may become a very serviceable member when it is connected with another idea that seems equally homely weird:—the understanding cannot judge any of this, unless it holds on to these ideas until they are judged in connection with one another. A creative mind, however, withdraws the guards before the gates; it seems to me that the ideas break in pêle-mêle and that only then the creative mind should review and judge the great mass of ideas. Hence our lamentations about barrenness ... you reject too early and separate (i.e. judge) too strictly." In other words, don't outline too early ... and: don't ever use an outliner in collecting your ideas. Trying to force ideas into predetermined slots is counter-productive. The first step in writing should be less judgmental. Outlines come in only later in the creative process.